Our junior testers felt the need, the need for speed, and the Moda Minor is a well-specified choice for your child's first 'proper' road bike. Weighing in at a fraction over 9 kilograms it might be heftier than your own carbon steed, but this aluminium bike is of a comparable weight to its junior road bike peers. One of our testers was graduating from a hybrid kids' bike and she certainly noticed how light and nippy the Moda Minor felt in comparison. 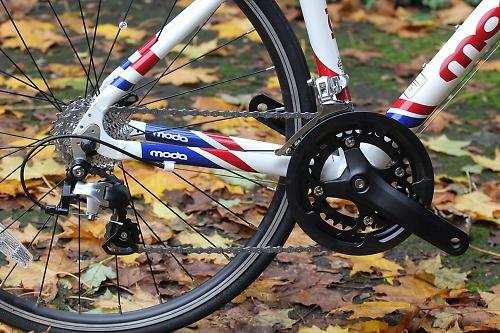 The more experienced children also noted the speed compared to their other road bikes; the Moda Minor certainly nips along a pace on its 24 inch Kenda tyres. The 15-inch frame fitted our tall 8 year old tester well. Her 11 year old friends were also able to ride the bike, albeit with the saddle near its upper limits. The stand over height was 24 inch and this was something our youngest tester found a little difficult to get used to as most children's bikes, especially those aimed at girls, have more dramatically sloping top tubes. When on the bike, however, the riding position worked well for all the children, placing them in a racy stance but not so far crouched over that they couldn't easily look up. They also enjoyed the wide gear range on offer. The Moda Minor has a 44/36 double chainset and a 11-26 9-speed cassette, giving an 18-speed gear (more than most of its peers) with a bias to the low range, making it easier for youngsters to get up hills. Unfortunately living in Cambridge our testers didn't get any really tasty climbs to try, but with a 33-inch low gear they should be able top cope with most. 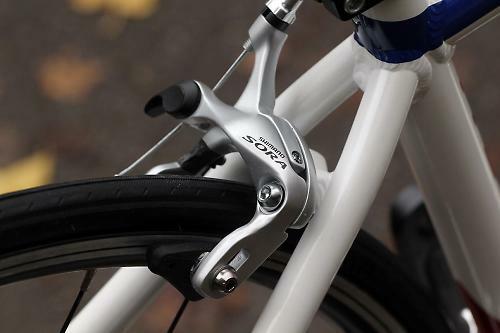 There are mudguard eyelets on the frame and fork, but there's not a lot of space for them in the short-drop brakes. That's a pity, because I would have been tempted to fit some for winter riding to stop the children from getting spattered in the recent damp weather. The saddle was appropriate but not noticably comfy. If this is your child's first road bike then they need to be prepared for the different feeling that comes from a race position and supported to work through that. Nevertheless, there's lots to like here for the younger rider, and our testers were soon cheerfully zipping about enjoying the lightness and speed of the Moda. Compared to the fat-tyred boat anchors that are most kids' bikes, it's a dream. Vitally, they all liked the colour scheme too, a mainly white coat with with dark red and blue accents. They commented that it would suit either boys or girls. However, one component did give all our testers problems: the Microshift brake/gear levers. Although the Moda Minor claims components chosen to fit a junior rider, all the children agreed that the brake levers were quite hard to pull and all struggled to reach them from the drops. None of the testers felt entirely confident about braking from the drops so tended to avoid them unless there was clear road for miles ahead, and riders with smaller hands struggled to brake from the hoods. Gear shifting with the Microshift brake/gear levers is accomplished with a pair of plastic levers behind the aluminium brake lever. Again, testers with smaller hands had trouble with these as they're a long way down the lever. The problem here is that nobody makes an integrated gear/shift lever that's scaled down properly for kids' hands. 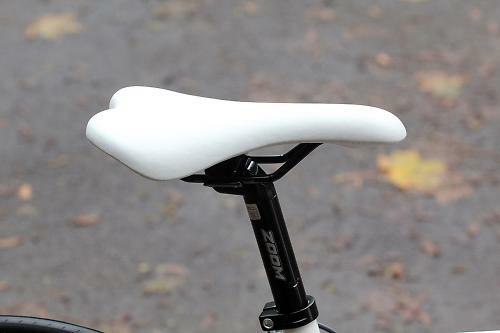 One tester remarked that the shifting was easier on her Islabike, which has Shimano levers. The lighter action works better for less strong young fingers. 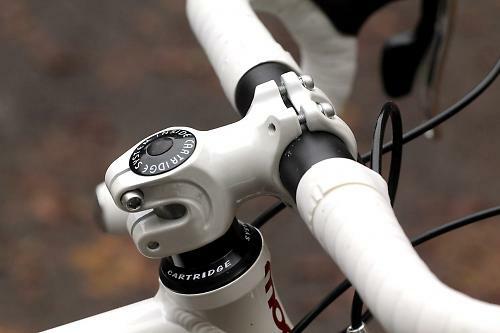 There's surely an opportunity here for a manufacturer to come up with a Shimano-compatible brake/gear lever that's suitable for riders with smaller hands. They wouldn't just be for kids. Plenty of women with small hands would like not to have to use levers intended for blokes with big hands. At £470, the Moda Minor is in the mid-range for children's road bikes of this size so the bike should be expected to last a good deal longer than a couple of seasons.The Moda has decent quality components and seems to be well built so you could expect it to last through a couple of children once handed down. The Moda Minor 24 2012 Kids Road Bike is a 24" specific road bike designed to give the next generation of road pro a head start on the competition. With geometry and components chosen to fit a junior rider, these bikes offer a great introduction to the world of road cycling. Full-size brake/gear levers are a problem for small hands. Not entirely Moda's fault as there aren't many options out there. Would you consider buying the bike? Yes, if and when our 8-year-old's hands could reach the brakes from the drops. Would you recommend the bike to a friend? Yes, but to test ride first for size. The sizing of the gear and brake levers needs to be scaled down significantly to suit some testers in the age group. Why do Youth bikes come so massively over-geared?! The maximum gear size in a British Cycling Youth race for an Under-10 is 5.4m so that means you need to lock out the front mech to stop them getting into the big ring and lock out the 11 and 12 sprockets. Epic fail on an otherwise really nice bike. Although in their defence, it's not just Moda, almost all kids bikes come WAY overgeared. 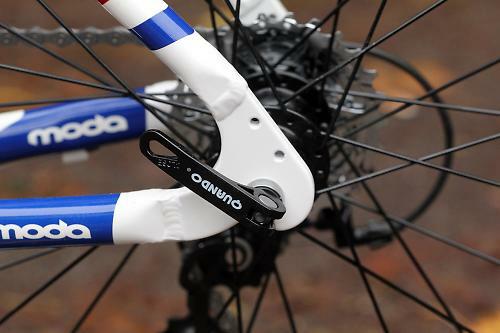 You will have noticed that single chainrings and wide ratio blocks have been selected for most of our bikes. We have observed that children struggle to understand how to use multiple chainrings effectively, and usually end up using only one ring. The arrival on the market of very wide ratio cassettes has allowed us to specify a single ring and still provide an appropriate range of gears, giving your child something they will find easier to operate with the added advantage of being lighter and lower maintenance. You say that about Islabikes, but they are overgeard too. Take the Luath 24 for example. If you want to race that as an U8 (where it is VERY common) you need to lock off 2 gears (11 & 12t) to get it under the gearing limit. The top gear you are left with (14t) is way under the limit too. The only way around that is a closer ratio rear block - we went with a SRAM one starting at 12t, with a 13t second cog which is spot on the limit. You still loose one gear off the block though. Great little bike rides very nicely. Ours came with Sora shifters, but my 10yr old son still can't change chainring gears. Disappointing. 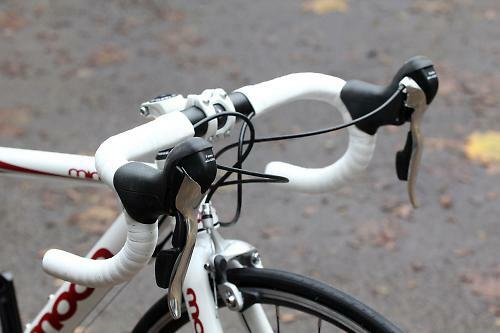 I think bar end or stem mounted shifters would be an improvement. Or perhaps I should leave him in the small chainring and buy a wider ratio cassette. The hoods are biggest issue with children on road bikes. And the biggest issue isn't the friction shifter, but braking on the hoods. 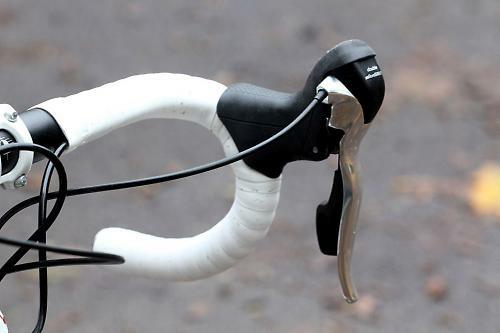 I assume this is why the wee one Decathlon do has a second CX type brake lever, the Isla's may have this too. I would block off the big ring and leave him in the small. To be honest, a rider has to be U14 before really needing a double anyway. That is a brilliant link Flying Scot. Exactly how I learnt to build bikes, and at about that age. Such a good way for children to learn how things work - and how to repair them. Incidentally good Suntour friction levers (as used on my bike) are ratchet in one direction and friction the other. They are very light to use. That does seem high - not wanting to doubt you, but what gearing calculator are you using? (Because I'm wondering if it took account of the smaller wheel size, or if it just assumed 700c). Thanks Giles, we sorted the shifter with a better one, it's just not in the thread. The brakes are still awkward though. I agree with these comments about STI-type levers for kids. On his first trip on his Moda Minor, my 9 year-old son went into a wall when he was unable to brake. Unconscious, three hours in A&E, plus broken helmet and bent forks. He'd spent an hour in the park practising using the brakes but he somehow forgot or couldn't use them quickly enough when the need arose. We swapped the drop bars for flat ones with separate brake and gear levers, which he was fine with. Moda bikes are great - this isn't just their problem. I have seen smaller boys and girls happily cycling with drop bars and STI-type levers but some are not as confident as other children using flat bars.